Perhaps one of Australia’s most loved trains, the ‘Tea and Sugar’ service commenced in 1915 to service some of the more remote places along the Trans-Australian route. 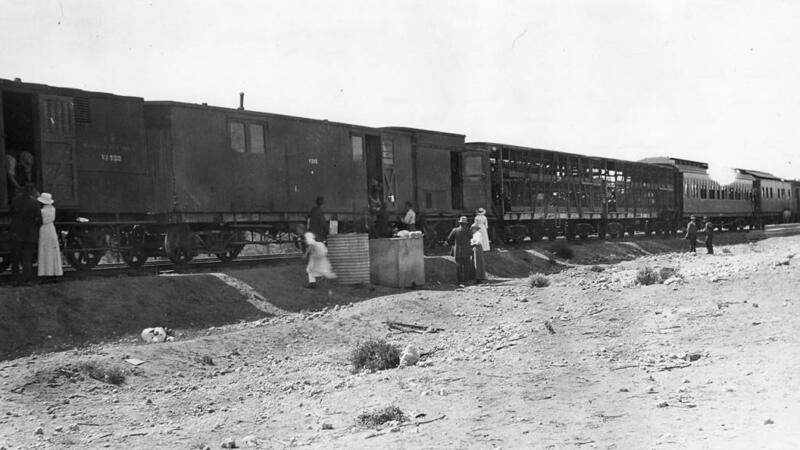 Although it started by simply providing good and services to workers in these remote locations, the service increased over time, providing more to a number of the isolated communities along the railway line between Port Augusta and Kalgoorlie. For many who lived and worked in these remote communities, the train changed their lives. The ‘Tea and Sugar’ carried more than just that. The train also carried fresh meat in a butchers van as well as a variety of groceries and even provided pay and banking facilities. Best of all, the prices of goods on the service was comparable to the major towns and cities. Firmly placing the service in the hearts of Australians, in the early 1950s the train even carried Santa Claus at Christmas time, distributing presents to children all along the railway route. The ‘Tea and Sugar’ was also used by the GPO for its mail run to these remote locations, with mail delivered to the station master where it could be collected by employees and families. The service soon expanded to include welfare services such as medical service, a children’s toy library and even a separate car housing a theatrette. The arrival of the train was a cause for great excitement, breaking the monotony of day to day life in these isolated locations. The people in the towns often referred to the train’s arrival as ‘Tea and Sugar Day’ and many of the women celebrated the occasion by getting dressed up to meet the train at its siding in style. As diesel locomotives replaced steam, welded rails were introduced and timber sleepers were replaced by concrete sleepers, the necessity for track maintenance was reduced and so too were the camps along the rail line. By the early 1980s services were even further restricted, with the route then terminating in Cook. By 1996 the ‘Tea and Sugar’ was no longer needed and took its last run. However with the service still holding a special place in the hearts of many Australians, parts of the train were kept for display. Australian trains enthusiasts can now see part of the famous train on display in Port Adelaide at the National Railway Museum.